Leigh's Fiber Journal: Have I Mentioned My New Fiber Source? Those of you who visit my homestead blog probably already know about Charlie. 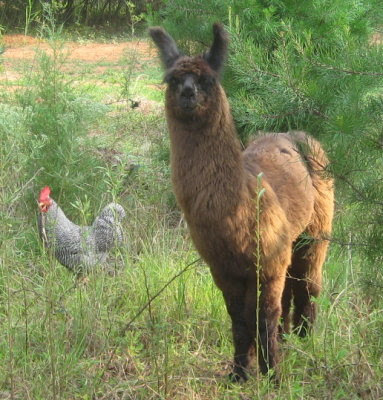 He's a "woolly" llama and is the newest addition to our homestead. 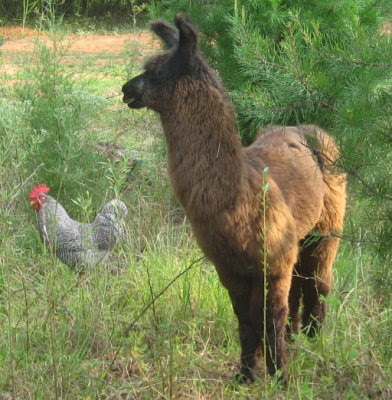 He's just a little guy, 6 months old, who is to serve as guard llama for the goats (and chickens apparently), and a fiber source for me. He's already been sheared this year, which is just as well, because we have our hands full just getting him used to us. Have I Mentioned My New Fiber Source? © August 2010 by Leigh at Leigh's Fiber Journal. Oh my gosh! HOW CUTE! .I want one!! Or an Alpaca or a sheep or a longhaired dog, anything i can get wool off of.I'm still looking for a wool type sheep but they are a rare find down here in the south. I think Charlie is going to make beautiful yarn for you! He's so cute and I'm so jealous!!! He's a very handsome fellow! Looks like a great coat, too.